Yesterday you learned about flying RC helicopters in a fast large circle circuit around your fixed position. Today you will learn how to fly a large fast figure 8 circuit out in front of your position. This is actually very similar to the last lesson on day 6 – the long skinny figure 8. You will be taking the fast forward flight skills you learned during day 8 and applying them to that slow and low skinny figure 8 to turn it into a large fast figure 8 circuit - the meat & potatoes circuit of circuits. No point mentioning pre-flight checks right – you do them automatically now. 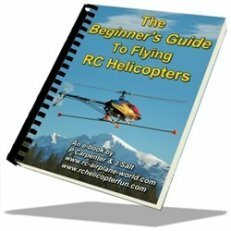 I still recommend you use your RC helicopter training gear during this lesson. They will help you with orientation as the helicopter flies fairly far away from you, and you will need them for day’s 10 lesson – the nose in hover, so you may as well leave them on. 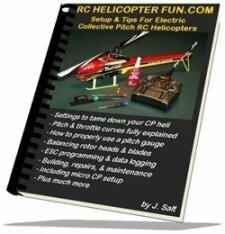 Start up your RC heli and start flying that very simple (by now) long skinny figure 8 in front of you about 3-5 feet above the ground. Slowly start making the figure 8 larger while increasing your altitude and forward speed. As you make your turns at the end of each figure 8 loop, start rounding them out and making them larger. This is where the large fast circle circuits from day 8 come into play. You should now be very comfortable seeing the orientation of your helicopter making those large turns at the end of each figure 8. If you start feeling a little shaky, slow down the helicopter and land. Regain your composure and try again. Some people rush this day and end up crashing – if you don’t feel comfortable, practice day’s 6-8 again. It took me the better part of a month practicing before I started flying RC helicopters in this large figure 8 myself. If you have a simulator to practice on, that time will probably be cut down in half or better. Some people catch on fast others take more time. Back to flying rc helicopters and our large figure 8. Keep increasing the size, altitude and speed of the circuit as you gain more and more confidence. Don't forget about the effects of translational lift when turning up or down wind. When it feels right and your speed is high enough, start banking your turns at the end of each figure 8 loop. Don’t forget to keep an eye on the timer or fuel level in the tank if you are practicing with a nitro. You will be having so much fun, time will fly. Remember the same rule applies to this large figure 8 as it did for the small one during day 6. Always turn the helicopter with the nose away from you, never towards you. Turn or bank left on the right side of the figure 8 and turn or bank right on the left side of the figure 8. This will ensure you don’t get disorientated. Once you learn the nose in hover during day 10, you can then start reversing the figure 8 or fly ovals with the nose of the helicopter turning towards you. Surprise, let’s learn an easy aerobatic maneuver. If you are 100% comfortable with this large fast figure 8, why not add a little pizazz and start working your way up to your first loop or 540 degree stall turn. Instead of performing a banking turn at each end of the figure 8, how about trying a hammer head stall turn. Before attempting this maneuver, make sure you have increased your cyclic pitch dual rate to at least 70% of full travel. You might even want to turn your cyclic dual rates off and see how responsive your helicopter has become. If you have fast reflexes and have mastered the large figure 8 circuit, you will have no problem adjusting to the quick controls. 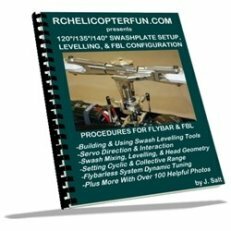 This is fun and more importantly will introduce you to a very simple aerobatic maneuver that will plant the aerobatic bug in your head and completely addict you to flying RC helicopters. When you are flying your large figure 8, instead of banking like you normally would, start pulling back on the cyclic to bring the nose of the helicopter up and as the helicopter starts slowing down, apply tail rotor to turn it 180 degrees to point it in the opposite direction (nose down in other words). The idea is to pull back on cyclic so your helicopter will be traveling more or less straight up. As the momentum slows, add tail rotor to turn the heli 180 degrees so the nose is now pointing towards the ground. Let the helicopter gain speed and pull it out of the dive obviously before the ground interferes. To make this not seem as scary at first, perform what is called a mild stall turn. Only point the nose up at about a 45 degree angle and add tail rotor as the heli slows down. The more you practice, the steeper the angle will become until you are getting very close to vertical. Well now that you have had lots of fun, it is time for our last lesson – Day 10 the nose in hover. This is not fun for most people, but it is very necessary if you want to progress further than flying RC helicopters in the simple figure 8 circuit.